For the first vfx post production brief we are asked to create a teaser trailer to a new anthology series based on the works of Jules Verne. I liked the concept of a balloon as a focal to a short scene integrating into a title. I considered what kind of imagery each title would convey and could be interpreted by an audience and I thought Five Weeks seemed to have a strong focal point (that of a balloon) that could be worked onto a world – I would only have to use a few elements to tell the essence of the story and give enough information to speculate on a narrative but also hold back and encourage the audience to want to find out more. This is an early idea on how I could introduce imagery in a cinematic way using few elements that could be layered with blending effects and create something otherworldly. Beginning with an idea of what kind of image we wanted for our source we compile a few artists and projects that could influence the direction of our designs. 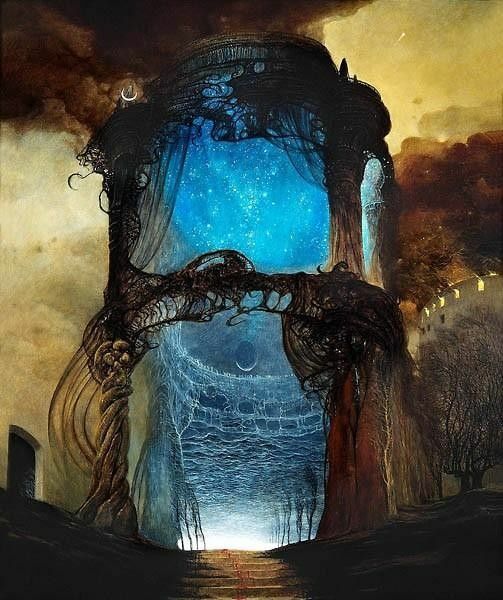 This is one of Beksinski’s portal paintings. I love how this works as interesting physical architecture and encourages you in an attempt to build the geometry to then find it is impossible. As a group are working of developing something that gives us pieces of a story with an element of the bizarre. My value tests to get composition ideas. Ideas we have discussed about texturing and lighting have been interesting when working out how to stylize the scene effectively with the geometric architecture. Keeping the design fairly clean-cut also has made navigating the UV far more efficient. In a texturing and lighting tutorial we looked at the X material for mental ray. This has presets that recreate very sharp reflective textures that seem perfect for blending to create a range of gems. The ability to mix these effects resulted in some very interesting reflective surfaces and mimicked precious gems very well. With some direction from my group, I made some assets to populate a dark ceremonial cavern with evidence of a long buried tomb. The altar has also taken on a few design styles – here are the early builds. We felt this was a little too sharp and over cumbersome to the scene. An altar is often more refined and I then looked to Mayan and Aztec architecture for some ideas for cleaner geometry. Here is the process of building a creature skull and some sacrificial tools. The creature skull developed into a major idea for the furniture of the scene – i built another creature and added some bones to frame the altar with large imposing idols that allow the audience to conjure up some beasts that may exist in this world. Using some tutorials I worked out how to use a 3D fluid node and created fire for the burner on the table. Currently, I hope to get some effective light beams using a volume box and light fog.